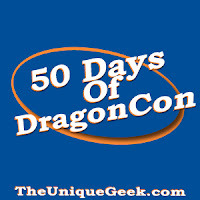 My friends over at TheUniqueGeek.com undertake a rather mammoth task of presenting 50 days of Dragon*Con related content every year during the build up to the big event. It's not always easy to give such content so I was asked one evening recently to have a chat with Jon and Serv about Dragon*Con and who I'm looking forward to seeing. Of course we get distracted and chat about other things too. To listen to the cast CLICK HERE or to download directly CLICK HERE.